Flood zone map. Photo provided by the City of Campbell River. CAMPBELL RIVER, B.C. – The Strathcona Regional District is hosting Campbell River’s second Shake Out and Get Out on October 18th. 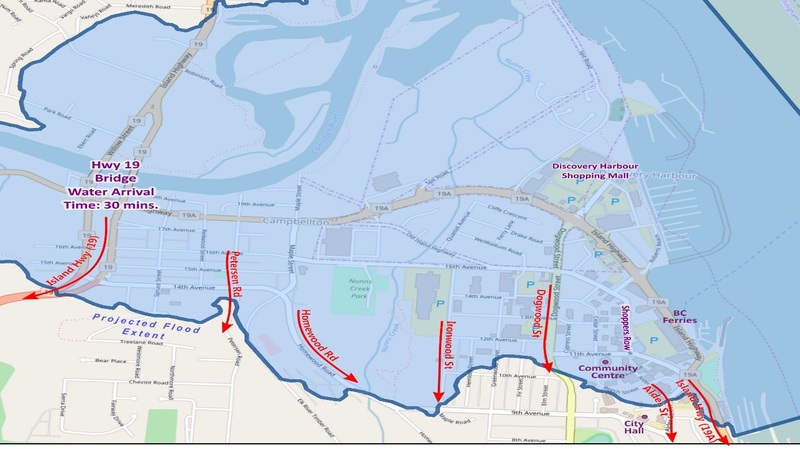 According to a news release, the purpose of the exercise is to create awareness of where the flood zones are (pictured), create awareness of evacuation routes, and test evacuation actions. 10:20 AM: After the “shaking” stops, count to 60, then begin evacuation. 10:24 AM: Evacuate to the nearest designated exercise checkpoint on foot or by bicycle. Register at the checkpoint and return to your original location. In case of an earthquake, low-lying areas in Campbell River, including the downtown area, would be at risk of flooding and the Strathcona Regional District hopes the Shake Out event will help prepare residents. Shake Out participants can also have a chance to win emergency preparedness prizes when they register themselves at an exercise checkpoint. Campbell River sits on the Cascadia Subduction Zone, a 1, 000 kilometre fault line running from northern Vancouver Island to northern California.